In 1964 one of the biggest choices rock 'n' roll fans had to make was whether they preferred the Beatles to the Dave Clark Five. That may seem absurd now, with the Beatles having been canonized and the DC5 usually remembered as just another group from the '60s. But when it all began, there were serious questions as to whether the Liverpudlians would be knocked back to the docks by the Tottenham quintet. 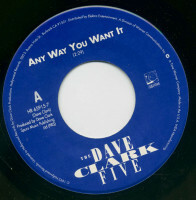 After initially scoring a #1 single in the U.K. with their second charting Columbia record, "Glad All Over" - indeed knocking the Beatles out of the top spot - the Dave Clark five followed the Fobs to America. Although "Glad All Over" only reached #6 here, the group - Clark, Mike Smith, Rick Huxley, Lenny Davidson and Denis Payton - quickly racked up hit after hit, until they were considered the second most popular band of the British Invasion. The usual maddening tours, countless television appearances, and even a film - Having A Wild Weekend - kept them in the eye of the English hurricane. But while the Beatles kept on going, kept on growing, the DC5's reign at the #2 spot began to give out by the end of 1965. After scoring their only U.S. #1 at the end of 1965 with a cover of Bobby Day's "Over And Over," the group returned to the Top 10 on the singles chart only once more, in 1967 with another cover, Mary Johnson's "You Got What It Takes." After 1967 the DC5 retreated back into obscurity as quickly as they'd arrived, the five musicians remaning basically unheard-from since. That may be an oversimplification, of course. In the eyes of. 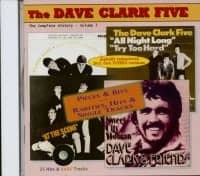 record collectors and those who have more than passing interest in the music of the '60s, the Dave Clark Five looms largely. A reunion tour, should it ever take place, would undoubtedly draw sell-out crowds wherever it went. Reissues of their hits would surely sell in respectable quantities. 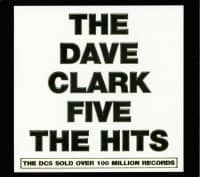 The reason there is not a tour, and there are no reissues, lies with Dave Clark himself. A shrewd businessmen when he had the group, (lark retained all rights to the group's recordings. He invested what money he made and today is a rich mon - with almost no interest in rehashing the post. Clark has steadfastly refused to give interviews regarding the group. preferring to concentrate on his present business interests. And they are considerable - (lark also wrote and produced the London musical Time, which recently shut down after a successful, lengthy run. The other members of the group have kept a low profile os well, some still active in the music business, others living "normal" lives away from the pop glare. Today their names are tough trivia answers, a situation belying the massive fame and adulation they enjoyed in the mid-'60s. 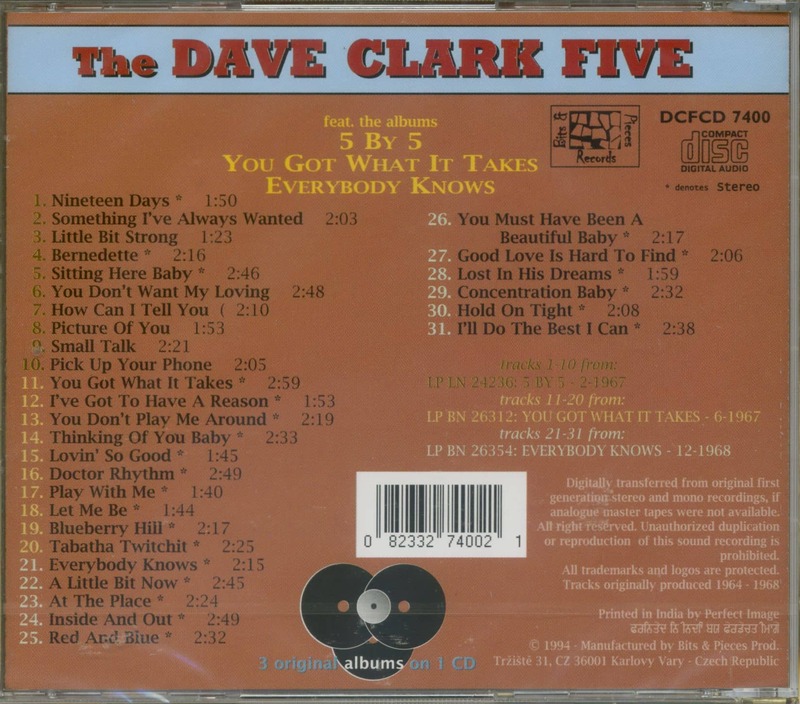 Indeed, although Mike Smith co-wrote many and sang all of the Five's biggest hits, it is unlikely that any but the truest fans recall the names of any DC5 members other than their namesake. To be fair, though, Dave (lurk was the undisputed leader of the Dave Clark Five. 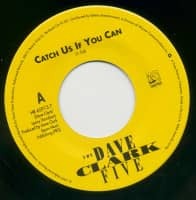 It was lie Vif% formed the group and called the shots; Clark even had the foresight to demand what would later come to be known as "artistic control" over the group's music; in an era when record companies made all the decisions, Dave (lark picked the recordings that would be released as DC5 singles. His instinct can't be disputed. The genesis of the group can be traced as for bock as 1957. Mike Smith (born Dec. 6, 1943), a keyboard player with an interest in Elvis, Chuck Berry and other early rockers, was playing with two friends, in a group called the Impalas, for a pub audience when Dave Clark (born Dec. 15, 1942), dropped in. He was impressed with Smith and the two became friends. 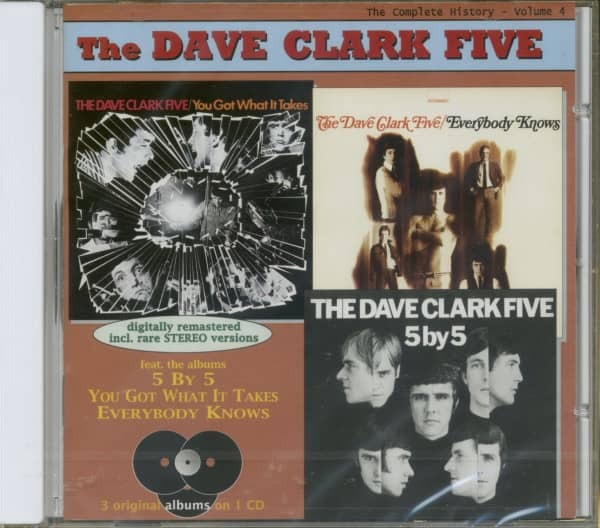 It would be another four years before the group that would evolve into the Dave Clark Five came together. The legend is that Clark needed money to send his soccer team to Holland for a tournament, and formed the band to raise the funds (there were actually six members at first, of whom only (lark, Smith and Huxley would survive to the final lineup). Today Mike Smith disputes that story as publicity hype, but in any case by 1961, with Payton and Davidson replacing the three dropouts, the Dove Clark Five, as they became known, were gathering momentum around Tottenham. North London, completely unaware that a similar phenomenon was enveloping the far-away town of Liverpool. The first recording made by the group was in 1961 for the Ember label.in Britain, a one-off "Tequila" sound-alike called "Chaquita." They switched to Pye Records for their next single, another instrumental called "First Love," and then cut a vocal, "I Knew It All The Time," for Piccadilly. Finally, the group was picked up by Columbia (Epic in the U.S.), where after a couple of duds. they scored their first hit in the U.K. in the fall of 1963 with "Do You Love Me," a cover of the Contours' hit. Only a month later, "Glad All Over" was beating the Beatles at their own game. In those days the pop scene was changing overnight, and the Dave (lark Five was only a step behind the Beatles in overtaking Americo. They toured in the spring of 1964, did the first of many Ed Sullivan Show appearances, and watched as smash after smash - "Bits And Pieces," "Can't You See That She's Mine," "Because," "Any Way You Want It," 'Do You Love Me," "Everybody Knows," "I Like It Like That," "Catch Us If You Can," "Reelin' And Rockin— and "Over And Over" - soared up the charts in America. Ironically, the group become more popular in Amercia than it was at home. There was always a note of controversy surrounding the Five's abilities as well. Admittedly not great musicians - Clark especially was an unremarkable albeit solid drummer - there was some question os to whether they played on their own records at all. Whatever or whoever was behind it, they made lasting rock '11 roll classics: "Because" is a beautiful, soulful ballad; "Any Way You Want It," with its echofied vocals (Mike Smith always double-tracked lead vocals), was a powerhouse ruler; and their ROB covers exhibited a funkiness that few other groups at that time could boast. The DC5 was a great rock 'n' roll band. But by 1970 it was apparent that the group was no longer a viable entity and they split up. Actually, the signs were obvious at least three years other. While the Beatles, Rolling Stones, Kinks, Animals and Who had evolved rapidly, and altered their appearances to match the new musical :onsciousriess, the DC5 was seen as passe and stagnant. Terminally :I lan-cut, they did not fit into the psychedelic age nor did they try to; ills, they were left behind in the rock wars. the members of the group drifted apart, although they occasionally worked together in various forms; Clark and Smith reunited as Dave :Ink and Friends in the early '70s, for example. Smith went on to work with a singer named John Christie in 1973 and with ex-Manfred Mann member Mike D'Abo in 1916. In 1980 Smith conducted a 55-piece la )(mese orchestra for the Yamaha Song Festival and he has been active iinging commercials, writing and producing ever since. Today, hiike Smith injoys a lucrative career as a session vocalist. It was during a recent session in New York that we caught up with him for this exclusive nterview. started playing places like American air bases, clubs, and dance halls. After we saved up our money, we went in and cut a couple of records, which didn't make it, and then we recorded a couple of more that did. So we had nothing to do with going to Holland. It was just a lot of media hype. 0: From what I understand, the initial lineup in the group was different from the bond we come to know on record. MS: In those early days, yes. The lineup was Mick Ryan on guitar; his brother, Ron Ryan; a sax player named Jimmy, and Stan Saxon, who Iron into not very long ago, believe it or not. That was the original group, and it was known as the Dave Clark Five featuring Stan Saxon. Then that group was disbanded, and when Dave got us all back together again, that's when Lenny and I joined. Rick Huxley was already in the group at that time, and then Dave recruited Denis Payton, who played sax, and it became a new day for the five. 0: You mentioned that both incarnations of the DC5 had saxophone players, which wasn't real common for bands in the mid-60s. How do you feel that instrument affected your music, in terms of setting it apart from the rest? MS: It's hard to say. Before we turned professional, we were playing clubs and paying our dues, and we found that a sax was great because it added another dimension and could also be very raunchy if we wonted it to be. I know if we just had piano, guitars and drums, the scope would be limited, whereas with a sox, it opened up our sound. 0: In the '60s, so much was said about the Tottenham Sound versus the Merseybeat. How did you perceive the musical differences? MS: Well, once again, it was really the media putting a name to it. Everybody likes to put something in a bracket, no they figured the Beatles were from the north, from Liverpool, and we were from the south, from London. And we hod different accents, different instruments, and we used different studios, so neurally, the music was going to come out different. But because we were the first two groups to make it big from England, it suddenly became a thing of north versus south, but we just simply had our own individual styles. 0: So much of the '60s press pitted you and the Beatles against one another, but was there really o sense of competition between you? MS: No. In fact, we did some of our very first TA shows together: including "Thank Your Lucky Stars," which I think was in October of '63. I remember turning up for the show and sitting in the stalls where the audience was going to be later, and there were o bunch of guys next to us who introduced themselves as the Beatles. They said they were performing at a place that was close to where I lived, so I suggested we get together. And for three weeks we were going out every night, imbibing a little, and playing rock 'n' roll. Customer evaluation for "Complete History Vol.4 - 5 by 5 - You Got What It Takes- Everybody Knows (CD)"